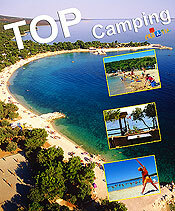 Šimuni are located in the bay which is one of the most beautiful marina on the Adriatic. ACI Šimuni has 150 berths and 50 dry berths, open all year. Although the fisheries to agriculture, particularly olives, the main industry, the beauty of the coast has made Simuni a tourist destination which primarily is recommended for a quiet family holiday. The beaches are sandy and gravel, which makes them a safe playground and swimming area for the youngest family members. Restaurants and taverns serving local food: lamb and delicious cheese with olives and fish and seafood prepared according to traditional recipes cookbook of island and the end will provide Pag jaundice. In the immediate vicinity of the town, in a pine forest located on the beach is a brand new car-camping. Plenty of rest with an unlimited supply of sea, sun and salt just waiting for you. Let your host to point out the places you visit on the island, in which you will enjoy. Currently we don't have historical facts on this site, but we will try to find out as soon as posible all available and relevant information to make your vacation as pleasant as possible.